The objective of this study was to determine the effects of land-use patterns on both diatom community composition and water quality in tropical streams during the dry season. Benthic diatom collections and water quality sampling were done 4 times at 10 sites. A suite of environmental variables that varied with human land-use pattern was assessed to find the combination of variables that best explained patterns of diatom community composition. 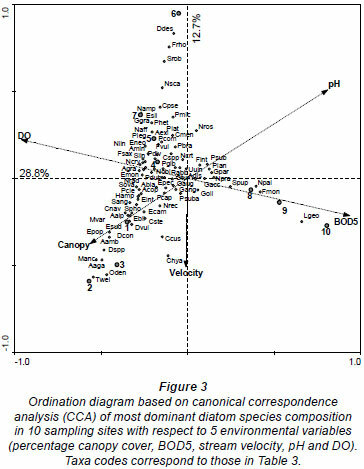 Canonical Correspondence Analysis (CCA) was used to determine environmental gradients along which species were distributed. A clear relationship between both benthic diatom communities and water quality and land-use pattern was observed with species richness, diversity and evenness, decreasing significantly from the agricultural and forest area to the urban area. Upstream, forested, agricultural sites, with good water quality (BOD5 = 0.9 to 2.6 mg·ℓ-1, DO = 6.8 to 8.2 mg·ℓ-1, phosphate = >2 to 4.7 µg·ℓ-1), were characterised by Thalassiosira weissflogii, Orthoseira dentroteres, Meridion anceps, Melosira varians, Diatoma spp, Diadesmis contenta, Eunotia papillo, E. bilunaris, E. intermedia, E. sudetica, Aulacoseira alpigena, A. ambigua, Cymbopleura naviculiformis and Stauroneis phoenicenteron. Urban sites, with medium to bad water quality (BOD5 = ~7 mg·ℓ-1, DO = ~7 mg·ℓ-1, phosphate = 12.6 to 83.1 µg·ℓ-1), were characterised by Diadesmis dissimilis, Frustulia rhomboids, Nitzschia scalaris, Nitzschia linearis, Cyclotella pseudostelligera Neidium ampliatum, N. affine, Encyonema silesiacum, E. neomesianum, Aulacoseira granulata, Navicula cryptotenella, Pinnularia legumen, P. gibba, P. divergens, Surirella linearis, S. robusta, and Achnanthidium minutissimum. Downstream urban sites, with very bad water quality (BOD5 = 19.5 to 26.2 mg·ℓ-1, DO = 0.4 to 1.9 mg·ℓ-1, phosphate = 142.5 to 248.7 µg·ℓ-1), were characterised by Gomphonema parvulum, G. accuminatum, Nitzschia palea, Nupela praecipua, Sellaphora pupula, Planotidium lanceolata, Fallacia monoculata and Pinnularia subcapitata. Diatom communities demonstrated potential for acting as indicators of changes in water quality due to changes in catchment land-use patterns. Land-use a function of cultural and settlement patterns, economic factors and environmental characteristics (Robbins et al., 1983; Black et al., 1998) and water resources (hence biotic communities supported by these water resources) are unequivocally linked. For example, results from predominantly agricultural watersheds, with some forests and urban development. showed that land-use had a distinct overall and seasonal effect on water quality (Osborne and Wiley, 1988). Studies in Pinelands of New Jersey also showed substantial land-use effects on natural water quality because of agricultural development, urban densities, and domestic wastewater flow (Zampella, 1994). Nutrient concentration, particularly phosphorus, increases with urban development due to stormwater runoff (Osborne and Willey, 1988; Welch et al., 1998). Increase in nutrient concentration is also a result of other catchment activities, such as runoff from agriculture or sewage treatment plants. Changes in water quality of lotic systems because of surrounding land-use patterns affects the resulting biotic communities, as the patterns of this biota are responsive to the nature of the prevailing physical and chemical conditions. The integrity of biota inhabiting lotic ecosystems thus provides a direct, holistic and integrated measure of the ecological conditions of a system as a whole (Karr, 1991) and the effects of land-use patterns. The relationship between diatoms and water physical and chemical variables is robust and quantifiable, making diatoms appropriate quantitative indicators of ecological conditions in lotic systems (Pan et al., 1996; Oliveira et al., 2001; Zampella et al., 2007). Growth and development of benthic diatoms in streams is an outcome of complex interactions between hydrological, chemical and biotic factors. Local factors such as hydrology, light, temperature and water chemistry are controlled by regional factors such as geology, topography or climate, operating at spatial scales of catchments as well as ecoregions (Biggs, 1990). In addition, human land-use activities act to change both local and regional variables at an increasing rate, affecting the resultant biotic communities. Winter and Duthie (2000) showed that the diatom community composition along an urban-rural gradient was correlated with total phosphorus and total nitrogen. Many studies have related diatom community composition to environmental variation, mainly in the temperate regions (e.g. Biggs, 1990, 1995; Descy and Coste, 1991; Rocha, 1992; Pan et al., 1996; Lobo et al., 1998; Rott et al., 1998; Chessman et al.,1999; Loez and Topalian, 1999; Stevenson and Pan, 1999; Potapova and Charles, 2003, 2005; De la Rey et al., 2008). However, few studies have specifically focused on the effect of land-use patterns in tropical systems, particularly north of Brazil. Understanding the relationship between land-use patterns, water quality and diatom community composition in streams provides a useful starting point for establishing stream water quality control regulations, conservation goals, ecological restoration efforts, and research hypotheses, all necessary for management of Brazilian and other tropical lotic systems. The objective of this study was to assess the response of stream diatom assemblages to changes in water quality associated with land-use, i.e., from agricultural and forest areas to urban areas. A suite of environmental variables that varied with human land-use pattern was assessed, in order to find the combination of variables that best explained patterns of diatom community composition. The study area is shown in Fig. 1. Headwaters of the study streams (Monjolinho, Gregório and Água Quente) fall mainly within an agricultural area. 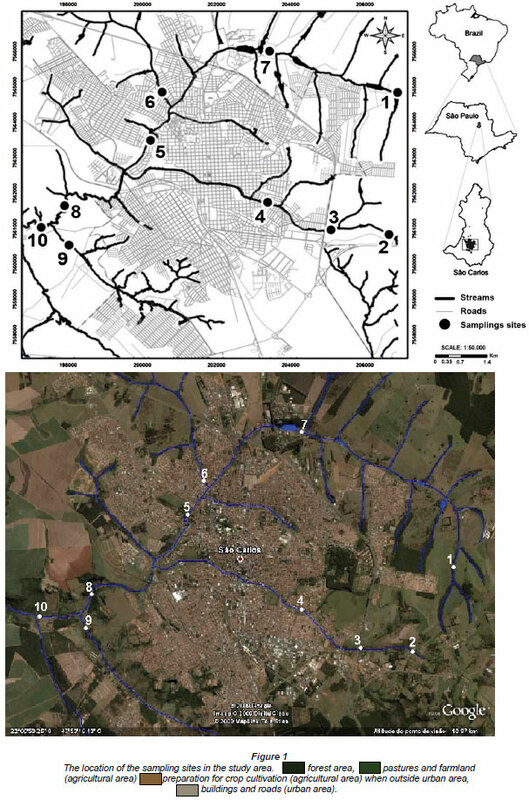 Apart from agricultural practices in the headwaters, the streams flow through an urban area of the city of São Carlos, which covers a total area of 1 143.9 km2. The area has rugged topography and an average annual temperature of around 19.5ºC, with a mean monthly maximum of 21.9ºC recorded in January and February and a mean monthly minimum of 15.9ºC recorded in July. In 2008, the population of São Carlos was estimated to be 218 080 inhabitants (by Instituto Brasileiro de Geografia e Estatística (IBGE)). The current expansion of the city does not meet the technical standards for sewage treatment, garbage collection and urban drainage. Streams in the study area, therefore, receive untreated or semi-treated effluent from various domestic and industrial sources, as well as other diffuse sources, as they flow through the city. The city also expanded without considering environmental, geological and topographical factors, leading to deforestation, erosion, and siltation. This unplanned growth, typical for many Brazilian cities and most developing country cities, results in many problems, including stream health deterioration, loss of primary vegetation, and eutrophication (Dupas et al., 2006; Rörig et al., 2007). Ten sites were established along Monjolinho River and its tributaries: 3 sites (1, 2 and 3) in the relatively less impacted agricultural and forested headwaters; 4 sites (4, 5, 6 and 7) in the moderately polluted urban area; and 3 sites (8, 9 and 10) in the highly polluted area downstream of the urban area (Fig. 1). The rationale in choosing the sampling sites was to cover a pollution gradient of all the stream systems, from relatively unpolluted agricultural headwaters to highly polluted urban downstream sites. Most of the area above upstream sites 1, 2 and 3 was mainly agricultural and characterised by mature deciduous riparian forest strips of about 5 to 50 m wide, with a mixture of pastures, homesteads and farmland beyond the riparian strip (Table 1). The area also had a low density of buildings, and much of the road network was unpaved. The area above Sites 4, 5, 6, 7, 8, 9 and 10 was mainly urban with more residences along the streams, a mostly paved road network and reduced riparian strips dominated by grass. In some cases, the grass along the stream edges is continuously mown. Some sections of the streams are canalised. Land-use patterns were interpreted from Google Earth Satellite Image System, June 2005 (Fig. 1) using the classification of Anderson et al. 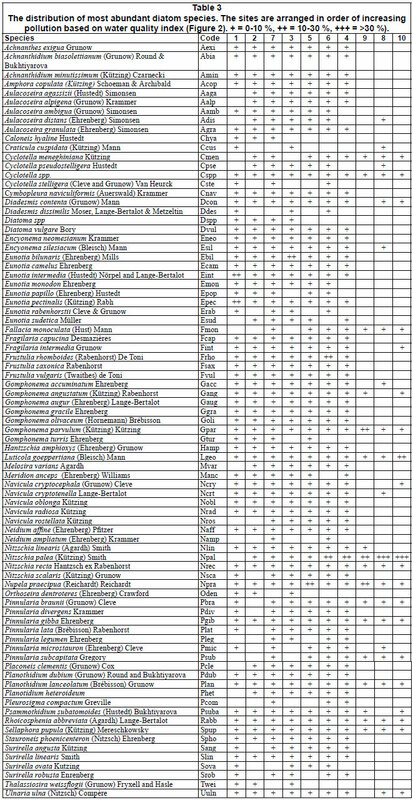 (1976) with classes combined to form 3 broad categories (forest, agriculture, and urban). Water quality sampling was done during the dry season when flow was stable. Four sampling trips were undertaken, two in September and October 2008 and two in May and June 2009. The dry season was selected to avoid variable effects of the rainy season, such as large variations in water level and velocity, floods and inundations, which affect diatom development, especially growth rate and relative abundance of different species (Duong et al., 2006). At each site, dissolved oxygen (DO), electrical conductivity, temperature, pH, concentration of total dissolved solids (TDS) and turbidity were measured using a Horiba U-23 and W-23XD Water Quality Meter (Horiba Ltd, Japan). The depth and current velocity were measured at each station with an FP 201 global flow probe (Global Water Instrumentation Inc. Alaska, USA). The percentage of riparian vegetation cover was estimated at each site. The percentage embeddedness (the degree to which large particles are covered with fine particles) was also estimated along each stretch and rated on a 0 5 scale following Platts et al. (1983). Altitude was determined at each site using a GPS (Northport Systems, Inc. Toronto, Canada). Light intensity was measured using LI-193 Spherical Quantum Sensor (LI-COR Worldwide, Brazil). Water samples for total nitrogen (TN), total phosphorus (TP), biological oxygen demand (BOD5), nitrate and phosphate analysis were also collected at each site into acid-cleaned polyethylene bottles following APHA (1988). WQI is a number between 0 and 100, with 90 to 100 = excellent, 70 to 90 = good, 50 to 70 = medium, 25 to 50 = bad and 0 to 25 = very bad (Brown et al., 1970). Where possible, epilithic (growing on stones), epiphytic (growing on macrophytes), epipelic (growing on mud) and epipsammic (growing on sand) diatoms were sampled separately at each site. Epilithic diatoms were sampled by scraping stones with a toothbrush. Prior to sampling of epilithic surfaces, all substrata were washed with water ejected from a syringe or shaken in the stream to remove any loosely attached sediments and nonepilithic diatoms. At least 5 pebble-to-cobble (5-15 cm diameter) sized stones were randomly collected at each sampling site, scraped, and the resulting diatom suspensions pooled to form a single sample, which was then put in a labelled plastic bottle. Epiphytic diatoms were sampled after Fisher and Dunbar (2007). Epipelic and epipsammic diatoms were sampled by pressing a Petri dish lid into the top layer of sand or silt/clay to a depth of 5-7 mm, followed by sliding a spatula blade under the Petri dish to isolate the contents in the dish, which were then stored in a labelled container. Six samples were taken from each station and integrated into a single sample. In the laboratory, sub-samples of the diatom suspensions were cleaned of organic material using wet combustion with concentrated sulphuric acid and mounted in Naphrax (Northern Biological supplies Ltd. UK. RI = 1.74) following Biggs and Kilroy (2000). Three replicate slides were prepared for each sample. Up to 600 valves per sample (depending on the abundance of diatoms) were identified and counted using the phase contrast light microscope (1 000 X). The diatoms were identified to species level based on studies by Metzeltin et al. (2005), Bicudo and Menezes (2006) and Metzeltin and Lange-Bertalot (2007). 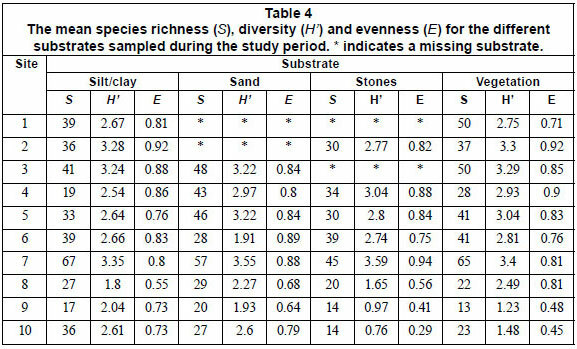 Species diversity (H'), richness (S) and evenness (E) were calculated following Shannon (1949) and were used as measures of community structure. 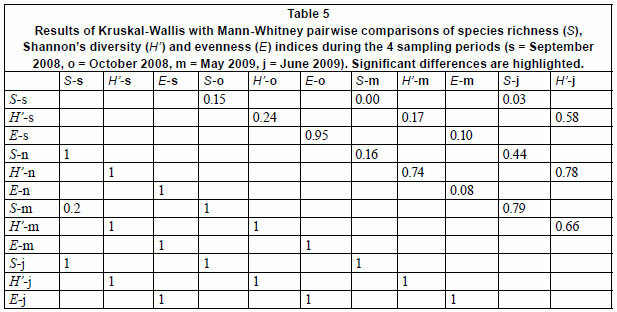 A nonparametric test, Kruskal-Wallis, analogous to analysis of variance, with Mann-Whitney pair-wise comparisons and Bonferroni correlation, was used to compare means of S, H' and E among substrates sampled, and among the 4 sampling seasons and 3 sampling site categories. The distributions of turbidity, conductivity, TDS, width, and embeddedness were positively skewed, and therefore were ln( × + 1) transformed (Zar, 1984). Two-way analysis of variance (two-way ANOVA) was used to compare means of environmental variables among the 4 sampling periods and among the 3 site categories. Multivariate data analyses were performed on the diatom data set to indicate the main gradients of floristic variation and to detect and visualise similarities in diatom samples. Preliminary de-trended correspondence analysis (DCA) was applied to the diatom data set to determine the length of the gradient. This DCA revealed that the gradient was greater than 3 standard deviation units (4.2), justifying the use of unimodial ordination techniques (Ter Braak and Verdonschot, 1995). Thus, Canonical Correspondence Analysis (CCA) was used to investigate relationships between predictor variables and benthic diatom communities from different sites. Preliminary CCA identified col-linear variables and selected a subset on inspection of variance inflation factors (VIF< 20; Ter Braak and Verdonschot, 1995). Monte Carlo permutation tests (999 unrestricted permutations, p < 0.05) were used to test the significance of the axis and hence determine if the selected environmental variables could explain nearly as much variation in the diatom data as all the measured environmental variables combined. Input for the programme included the relative abundance of diatom taxa that were present in a minimum of 2 samples and had a relative abundance of >1% in at least 1 sample. All statistical analyses, DCA, CCA and Kruskal-Wallis, were performed using PAlaeontological STatistics (PAST) software Version 1.90 (Hammer et al., 2009). 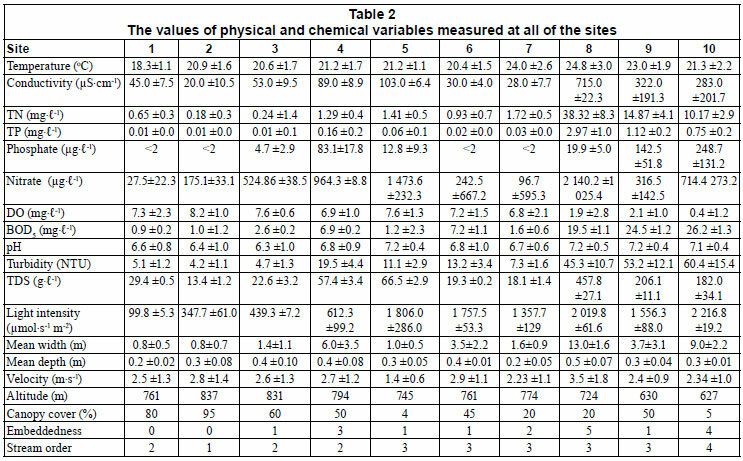 The values of the physical and chemical variables measured are shown in Table 2. The pH increased slightly down the agricultural to urban gradient, being slightly acidic at upstream sites and slightly alkaline/neutral at downstream sites. However, the difference in pH among the 3 site categories was not statistically significant (ANOVA, p > 0.05). Temperature increased downstream, but, as in the case of pH, the increase was not significant (ANOVA, p > 0.05). On the other hand, conductivity, BOD5, TDS, turbidity, light intensity, TN, TP, nitrate, phosphate and embeddedness increased significantly downstream (ANOVA, p < 0.05), while DO and percentage riparian vegetation cover decreased significantly downstream (ANOVA, p < 0.05). No significant differences were observed in mean environmental variables among the 4 sampling periods (ANOVA, p > 0.05). This is expected since all sampling was confined to a stable base flow period when variations in water chemistry are low compared to the rainy season. Therefore, the mean environmental variables of the 4 sampling periods at each site were used for subsequent analysis. The water quality generally tended to deteriorate downstream, as the streams pass through the urban area, due to discharge of treated and untreated domestic and industrial effluent as well as other diffuse sources of pollution from the city (Fig. 2). 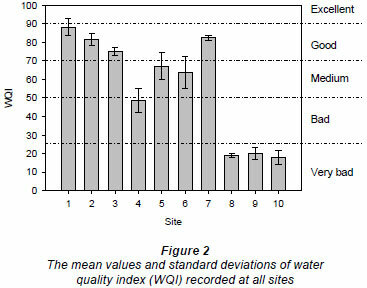 The mean water quality of Sites 1, 2 and 3, situated in a forested agricultural area, as well as Site 7, was good (with excellent water quality at Site 1 during September and October 2008). Site 4 exhibited bad water quality while Sites 5 and 6 displayed medium water quality. On the other hand, the water quality of Sites 8, 9 and 10, situated after the urban area, was very bad. A total of 208 diatom species belonging to 63 genera were recorded. Twenty-two genera accounted for 91.7% of the overall diatom community. Of the 208 species observed, 82 species were retained for subsequent analysis (present in a minimum of 2 samples and had a relative abundance of >1% in at least 1 sample) (Table 3, next page). Species richness, diversity and evenness differed significantly (Kruskal-Wallis, p < 0.05) among sampling sites, tending to be higher in upstream, relatively unpolluted and mainly agricultural and forested area, compared to downstream, polluted, mainly urban sites (Table 4). No significant differences (Kruskal-Wallis, p > 0.05) in S, H' and E were observed between the substrates sampled for the 4 sampling periods, except for species richness between the September and May and September and June samples (Table 5). Therefore, a pooled data set, consisting of diatoms sampled during 4 sampling periods and among 4 substrates, was used to investigate spatial trends in the composition of diatom communities. The results of the CCA are presented in Fig. 3. The first four axes of the species-environment plot accounted for 94.1% of the total variance in the community due to measured environmental variables (Table 6). Axis 1 and 2 explained 47.7% and 21.0%, respectively, of the diatom species variance. Monte Carlo unrestricted permutation test indicated that Axis 1 (99 permutations) and Axis 2 (99 permutations of Axis 2 with Axis 1 as a covariable) were statistically significant (p < 0.05). BOD5 and pH were positively associated with the first axis while DO and percentage canopy cover were negatively respectively associated with the first axis. pH was also positively associated with the second axis while stream velocity was negatively associated with the second axis. CCA Axis 1 and 2 separated the sites into 3 groups along an agricultural to urban gradient (human-induced increase in nutrients and organic pollution and decrease in DO and percentage canopy cover). The first group consisted of forested and agricultural sites with good mean water quality, Sites 1, 2 and 3 that were negatively associated with the first and second axis in the bottom left quadrant (Fig. 3). These sites were associated with high canopy cover (which was negatively correlated to temperature, light intensity and mean stream width) and low BOD5 (which was positively correlated with TDS, TN, TP, nitrate, phosphate, conductivity and depth). Diatom species characterising these sites include species such as T. weissflogii, O. dentroteres, M. anceps, M. varians, Diatoma spp, D. contenta, E. papillo, E. bilunaris, E. intermedia, E. sudetica, A. alpigena, A. ambigua, C. naviculiformis and S. phoenicenteron. N. praecipua, P. lanceolata, F. monoculata, P. subcapitata and G. accuminatum. These species have been reported to be pollution tolerant (Biggs and Kilroy, 2000; Potapova and Charles, 2003; Duong et al., 2006). Diatom community structure showed a clear relationship with changes in water quality associated with changes in land-use pattern. For instance, species richness, diversity and evenness decreased along a forest and agricultural to urban land-use gradient (human-induced increasing nutrient and organic pollution gradient). Low pollution tolerant species, such as T. weissflogii, O. dentroteres, M. anceps, M. varians, Diatoma spp, D. contenta, E. papilla, E. bilunaris, E. intermedia, E. sudetica, A. alpigena, A. ambigua, C. naviculiformis and S. phoenicenteron were replaced by moderate pollution tolerant species such as D. dissimilis, F. rhomboids, S. robusta, N. scalaris, C. pseudostelligera N. ampliatum, E. silesiacum, E. neomesianum, N. affine, N. linearis, A. granulata, N. cryptotenella, P. legumen, P. gibba, P. divergens, S. linearis and A. minutissimum. The latter group of species was replaced by high pollution tolerant species such as N. palea, G. parvulum, S. pupula, N. praecipua, P. lanceolata, F. monoculata, P. subcapitata and G. accuminatu, which are known to be resistant to organic and high ionic strength and conductivity (Van Dam et al., 1994; Biggs and Kilroy, 2000; Potapova and Charles, 2003). These species have also frequently been recorded in waters that are nutrient rich and poorly oxygenated, with high electrical conductivity (Van Dam et al., 1994; Bere and Tundisi, 2009). Researchers have reported different effects of land-use patterns on benthic diatom community structure, in terms of diversity and evenness. Cuffney et al. (1997) found that taxa richness of benthic-algal communities, with diatoms as a dominant component, did not show a strong relationship with land-use or water quality. Hill et al. (2001) concluded that diatom community structure has no predictable relationship with human-related watershed disturbances. However, Chessman et al. (1999) associated an increase in genus richness with increasing alkalinity, conductivity, hardness, and pH related to land-use pattern, and Hill et al. (2003) reported that diatom-species richness was positively correlated with total phosphorus and nitrogen also related to land-use pattern. This supports the results of the current study. Several other studies have also demonstrated the association of land-use with diatom community structure, in support of the present study (e.g. Morgan, 1987; Pan et al., 1996; Kutka and Richards, 1996; Leland and Porter, 2000; Carpenter and Waite, 2000; Salomoni et al., 2006). Perhaps the study most relevant to the current study is that conducted by Gómez and Licursi (2001) on epipelic diatoms in the tropical streams of Argentina, in an environment similar to this study. They classified 88 diatom species frequently found in the epipelion of Pampean streams and rivers, based on ecological preferences according to water quality. Thirteen of these species were among the most frequently occurring species in our study (Table 3): A. minutisimum, A. copulata, E. silesiacum, F. capucina, G. angustatum, G. parvulum, H. amphioxys, N. cryptocephala, N. linearis, N. palea, N. recta, S. phoenicenteron, P. gibba and S. pupula. The distribution of all these species in relation to pollution was consistent with that described by Gómez and Licursi (2001). The CCA results showed that BOD5 (also positively correlated with TDS, TP, TN, phosphate, nitrate, conductivity, turbidity, temperature and embeddedness) was important in structuring benthic diatom communities in the study area. Environmental monitoring studies in Southern Brazil (e.g. Oliveira et al., 2001; Lobo et al. 2002, 2004; Salomoni et al., 2006) showed that diatom communities in lotic ecosystems are a result of the interaction of variables characterising the process of organic contamination as well as eutrophication. In this study, highly eutrophic and high organic pollution sites, Sites 8, 9 and 10, had high relative abundances of such species as G. angustatum, G. parvulum, N. palea, N. praecipua and S. pupula. N. palea, G. parvulum, S. pupula, N. praecipua, P. lanceolata, F. monoculata, P. subcapitata and G. accuminatum. These species have been classified as typical for eutrophic and organically polluted environments (Kelly and Whitton, 1995; Van Dam et al., 1994). Numerous studies conducted on lotic benthic diatoms sampled in various countries have shown the influence of organic pollution (Sládecék, 1986; Salomoni et al., 2006), eutrophication (Kelly and Whitton, 1995; Ponader et al., 2007; Lavoie et al., 2008), and dissolved oxygen (Biggs and Kilroy, 2000; Potapova and Charles, 2003) in structuring of diatom communities. Canopy cover (which was negatively correlated to temperature, light intensity, mean stream width and turbidity and is highly dependent on land-use patters) was also found to be important in structuring benthic diatom communities in the study area. This is because of the importance of light for diatom photosynthesis (Ter Braak and Van Dam, 1989; Biggs, 1990, 1995; Patrick and Hendrickson, 1993; Pan et al., 1996; Biggs and Kilroy, 2000; Carpenter and Waite 2000; Potapova and Charles, 2002, 2003, 2005). Diatom communities in forested agricultural sites were, thus, different from those from open urban sites. However, stream velocity (not directly related to land-use pattern) was also found to be important in structuring diatom communities in the study area. Site 7 was grouped together with bad to medium water quality sites, Sites 4, 5 and 6, because of its low velocity, despite its good water quality. The importance of velocity in structuring benthic diatom communities has also been reported by other researchers (e.g. Biggs, 1990, 1995; Patrick and Hendrickson, 1993; Pan et al., 1996; Biggs and Kilroy, 2000; Potapova and Charles, 2005). This study was made possible by the provision of funds from Third World Academy of Science (TWAS) through Conselho Nacional de Desenvolvimento Científico e Tecnológico (CNPq). I also wish to thank the Instituto Internacional de Ecologia management and staff for their support during the course of this study. Received 1 March 2010; accepted in revised form 24 November 2010.